“Barefoot in the Kitchen” is Longevity’s new web based video series. We will a share an everyday, easy-to-cook healthy recipe, for you and your family. Included in this unique experience will be a panel of experts, including a dietician to guide the process and explain what ingredients are best for good health and vitality. Kenneth Ngubane is the executive chef at Tsogo Sun’s Punchinello’s and the banqueting operations manager of Tsogo Sun’s conferencing venues at The Pivot at Montecasino. He has been in the industry for 27 years, trained chefs within the group (including Masterchef’s Benny Masekwameng) and judged SA Chefs Association competitions. He also headed up the kitchen for MasterChef SA Season 1 winner Deena Naidoo at Aarya in SunSquare, Montecasino. Rinse the quinoa well before starting. Place the rinsed quinoa, milk and water in a pan and cook, partially covered, for 15 minutes. Add the dried fruit, spices, orange zest and pumpkin seeds. Cook for a further 15 minutes. If dry, add a splash more water to loosen things up. If too wet, cook longer to evaporate some of the moisture. Add a teaspoon of honey and enjoy. Place two large pieces of plastic wrap on a work surface and make sure they overlap slightly. Then spread half the salt mixture on the surface, to the dimensions of the piece of salmon. Place the salmon on the salt with the skin-side down, and top with the remaining salt mixture. Fold the plastic wrap around the salmon tightly; place it in a large dish and place something flat and heavy on top (a small cutting board works well). Allow the fish to cure for 24-48 hours before unwrapping it. Once it is well cured, scrape off the remaining salt, rinse and pat dry. If time permits, you can return it to the fridge for 3-12 hours, uncovered. In a small saucepan mix the cream, Dijon mustard, mustard powder and pepper. Stirring continuously, simmer the sauce for one minute until it thickens slightly. Finally, season with salt to taste. 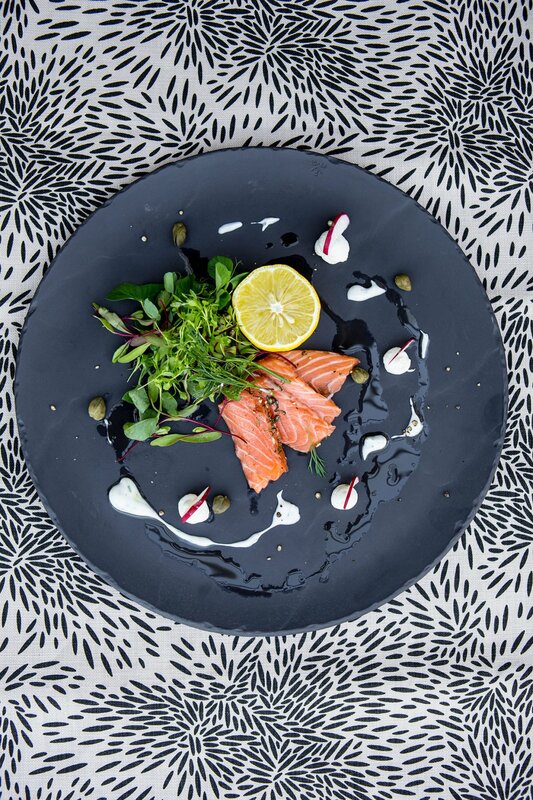 Place the salmon skin-side down, on a cutting board. With a sharp knife, slice the fish as thinly as you possibly can, while holding the blade at a diagonal angle. Lay equal portions of the fish on each plate, and serve with 4 teaspoons of crème fraiche, a light drizzle of the mustard sauce, 4-5 capers, a few finely sliced pieces of radish and micro-greens for garnish. In a bowl, combine the shredded spinach tomatoes, cucumber, spring onion, Peppadews and blue cheese with your hands, until well mixed. Transfer the contents onto a wooden board or salad bowl. 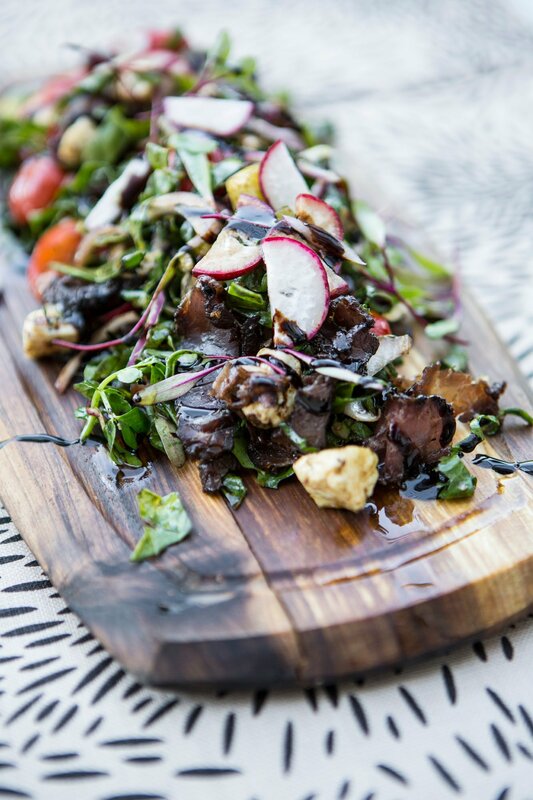 Place the biltong on top of the salad and drizzle with reduced balsamic vinegar and add salt and pepper to taste. Transfer the contents into a large bowl and add the bread, parsley, sage, thyme, rosemary, tinned chestnut, salt and pepper. From there, stir in 290ml of hot chicken stock. Lay the sweet potatoes, parsnips and turnips around the turkey, and drizzle with olive oil and a pinch of salt. 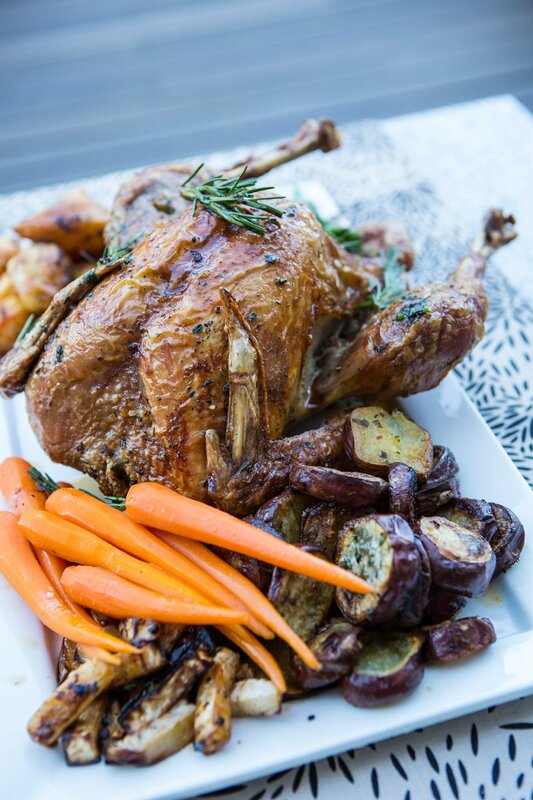 Roast the turkey and vegetables for 90 minutes, until cooked all the way through and golden brown on top. Blanch baby carrots and beans, and refreshed in iced water, to serve alongside the roast. Place cranberry juice and water in a medium saucepan, and heat on the stove until it is about to start boiling. Add the gelatine; stir to dissolve and refrigerate for about one hour (or until just starting to set). It should have a thick, syrupy consistency. Combine the cream and vanilla extract in a small saucepan. Bring to the boil and then set aside. Place the egg yolks into a large bowl with the xylitol and whisk until thick and pale. Pour the vanilla-infused cream onto the whisked egg yolk and sugar mixture, stirring well. Quickly wash out the saucepan and pour the mixture into the clean, dry pan. Return the pan to a low heat and cook slowly, stirring continuously with a wooden spoon until the custard is very thick. Arrange the cake at the bottom of four individual glasses or ramekins, and spoon half the jelly over the top of each one. Top with a thin layer of custard and a generous sprinkling of fresh berries. Spoon remaining jelly over the top and refrigerate the trifles overnight, ensuring they are covered. The next day, using an electric mixer, beat the cream with the xylitol in a bowl until soft peaks form. 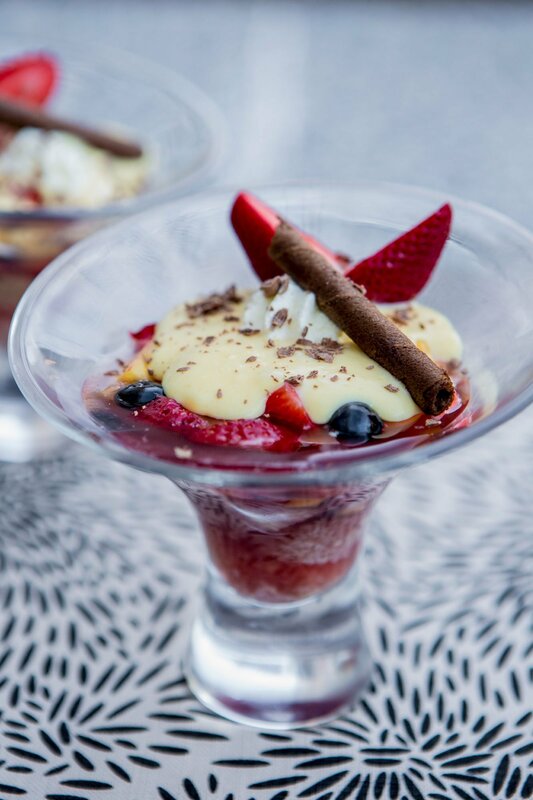 Place a few teaspoons of cream over the trifle, top with fresh berries and serve. Matthew Foxon is the executive chef at Tsogo Sun’s 54 on Bath, Rosebank. South African-born, Foxon completed a two-year advanced diploma in professional cookery at the International Hotel School in Johannesburg. Since then he has worked in luxury hotels across South Africa, been awarded the Young Chef of the Year for two consecutive years (2003 and 2004), run both the award-winning Greyhound at Bettersea and The Rosendale, as well as the critically acclaimed Criterion Restaurant in London, and starred in the BBC hit series MasterChef. “This is a bulk recipe that can be made in advance and stored. You can then scoop the amount you want into your bowl, and add grated green apple, plain double-thick yoghurt (or cottage cheese) and orange blossom honey to taste,” Foxon says. Toast the nuts and oats on separate trays, for 8 minutes at 160°C. Mix and place back in the oven for 4 minutes. Repeat until all ingredients are an evenly toasted, light caramel colour. Allow the muesli to cool before adding the dried fruit and toasted coconut. Nutrition expert Jessica Pieterse says: “Oats are a source of soluble fibres which naturally help to lower cholesterol levels. This is possible because they contain betaglucan fibres, which bind to the cholesterol in the gut and assist in its removal. This dish is great for diabetics, as it follows the guidelines of a Mediterranean diet. It includes tuna, which is high in Omega-3s; a variety of colourful vegetables, which are rich in antioxidants; and good-quality fats. It also makes use of capers, which have been shown to lower blood sugar. Cut the baby gem lettuce in half, lengthways, and wash with running cold water. Then place it upside down in a bowl and allow to drain. Place the vine tomatoes on a tray, drizzle with olive oil and season. In a pot of seasoned boiling water, place the green beans to blanch for 2 minutes before refreshing in ice water. Mix your capers, spring onion and green beans in a salad bowl, and drizzle with olive oil. Place a heavy-bottom sauté pan or griddle pan on high heat. Drizzle olive oil onto the tuna, and then season with salt and pepper. Sear the tuna for 2 minutes; flip and sear the other side for 1 minute. Serve hot. Health benefit: “Eating an egg a day will not increase your risk for developing high cholesterol, as previously thought. In people with no diabetes or heart conditions, studies showed no difference between eating one egg a day and eating two – or fewer – eggs a week on stroke or heart disease risk,” Pieterse states. Bulgur wheat is a satisfying replacement for refined carbohydrates, making it a great alternative for diabetics. This recipe also includes a variety of nutrient-dense fruit and vegetables, as well as healthy fats in the form of cashews and walnuts. Bring the bulgur wheat to the boil; cook until tender (about 10 minutes), strain and set aside. While the bulgur wheat cooks, dice the red pepper and cucumber, roughly chop the cashews and walnuts, dice the apricot and quarter the cherry tomatoes. Mix with the spinach and pomegranate, and add to the drained bulgur wheat. Mix in a squeeze of lemon juice and a good amount of olive oil, and season to taste. Preheat the oven to 180°C. Season the chicken breast and place skin side down in a hot pan; wait for the skin to brown, then turn and seal on the meat side. Place in the oven for 8 to 12 minutes. Remove and cover with foil. Allow to rest for 5 minutes – this allows the juice to seep back into the meat and finish cooking the breast. You can add freshly chopped herbs in at the end to give it an extra boost of freshness. Use chives, parsley, coriander, basil and even mint, which really lifts the dish when using fish or lamb. These herbs are also known to have properties that assist in diabetes prevention and treatment. Pieterse adds: “Aim for starches that have more than 6g of fibre per 100g of product. Bulgur wheat offers 11g of fibre per 100g. 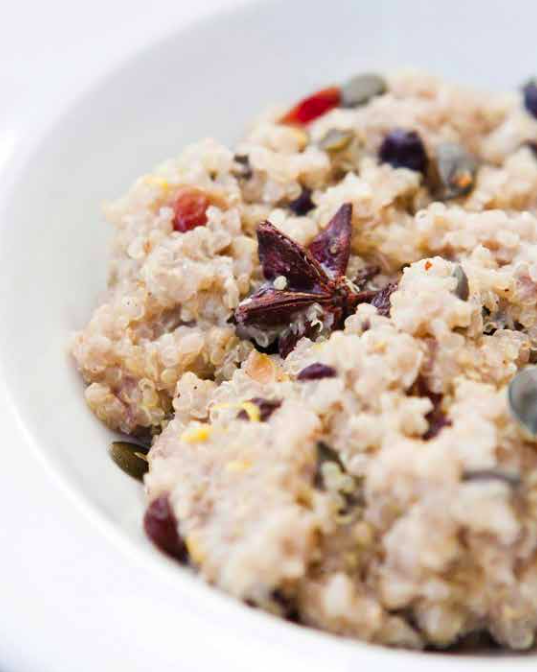 This recipe can supply almost half of the recommended daily fibre intake of 25-38g per day. This is crème brûlée with a twist. We have switched the sugar out for isomalt – a sugar alcohol with minimum impact on blood sugar levels – making it more diabetic-friendly. Of course, portion size and moderation are key. pod in as well, and set aside. Put the egg yolks and sugar in a mixing bowl, and whisk for 1 minute with an electric hand whisk, until paler in colour and a bit fluffy. Put the pan with the cream on a medium heat and bring almost to the boil. As soon as you see bubbles appear round the edge, take the pan off the heat. Pour the hot cream into the beaten egg yolks, stirring with a wire whisk as you do so, and scrape out the seeds from the pan. Use a fi ne sieve to strain it. Scoop off all of the pale foam that is sitting on the top of the liquid (this will be several spoonsful) and discard. Give the mixture a stir. Pour enough hot water (from the tap is fi ne) into the roasting tin to come about 1,5cm up the sides of the ramekins. Pour the hot cream into the ramekins and fill them up right to the top. Put them in the oven, and lay a baking sheet over the top of the tin so it sits well above the ramekins and completely covers them, but not the whole tin, leaving a small gap at one side to allow air to circulate. Bake for 30-35 minutes until the mixture is softly set. To check, gently sway the roasting tin, and if the crème brûlées are ready, they will wobble a bit, like a jelly, in the middle. Don’t let them get too fi rm. Lift the ramekins out of the roasting tin and set on a wire rack to cool, for a couple of minutes only; then put them in the fridge to cool completely. When ready to serve, sprinkle 1ó teaspoons of isomalt sugar over each ramekin and spread it out with the back of a spoon to completely cover. Spray with a little water using a fi ne spray; then use a blow torch to caramelise it. Hold the flame just above the sugar and keep moving it round and round until caramelised. Serve when the brûlée is firm. Health benefit: Pieterse advises: “Desserts should not be eaten on a regular basis, as they are often high in kilojoules, sugar and fat. Managing your portion size can prevent desserts from being too indulgent. Share dessert with your partner or friend, dish up only a few mouthfuls or serve in small dishes to prevent overeating. “Quinoa is full of amino acids and is a complete protein. It is excellent if your digestion is feeling a little sluggish, as it’s such a light grain,” says Atkinson. “The ladies didn’t believe me when I said this was easy. I think they were pleasantly surprised,” says Atkinson. “How spicy you make this dish is up to you. 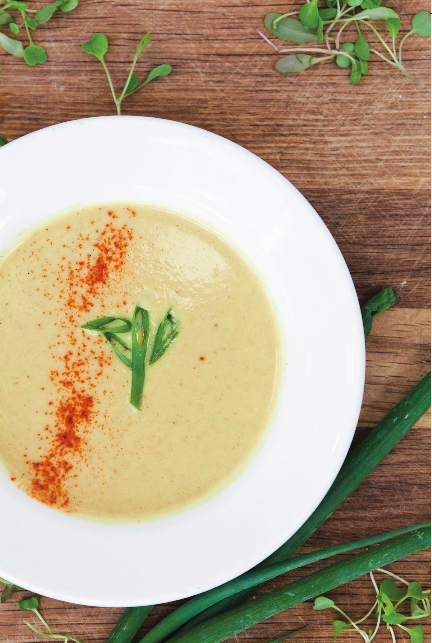 We have erred on the milder side, but if you like things with a bit of a kick, add a little more curry powder or even a pinch of cayenne pepper,” says Atkinson. Heat the olive oil in a pan, and add the onion, celery and carrot. Sweat together for about 5 minutes and then add the chopped garlic. Once the onions have softened, add the spices and fry together for a few more minutes. Add the cauliflower and stir to ensure that the spices are mixed in. Let the vegetables steam together for a minute or so before adding the vegetable stock. Bring the pan to boil and then reduce to a simmer. Add the coconut cream and stir to combine. Allow the pan to simmer for about 30 minutes with the lid on. After checking that the cauliflower has cooked through, take the pan off the heat and blitz with your stick blender until smooth. Check the seasoning and adjust as required. Sprinkle on just a pinch of cayenne pepper before serving with your favourite bread.